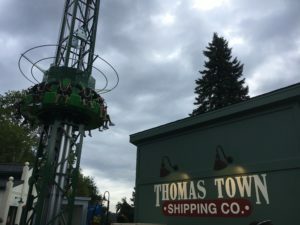 Sponsored post – Kennywood hosted us for the opening of Thomas Town. All opinions are my own. 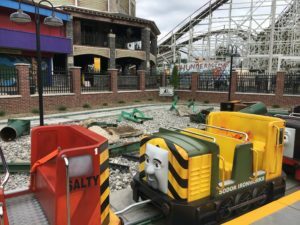 Thomas Town is now open at Kennywood Amusement Park near Pittsburgh, Pennsylvania. The town includes five rides, a soft play area, and a Thomas merchandise gift shop. 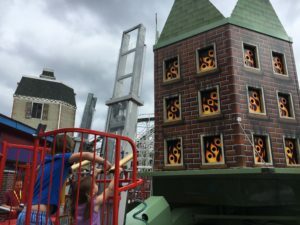 The opening of the town really puts the focus on families with young children, as many of the rides allow toddlers the ability to enjoy more fun rides at this family-friendly amusement park. Flynn’s Fire Training – Junior firefighters, as well as adults, can board a fire engine and shoot water to extinguish “flames” as lifts move them up and down. The trucks move in a circle around the flaming buildings. Children under 36″ must ride with a responsible person. 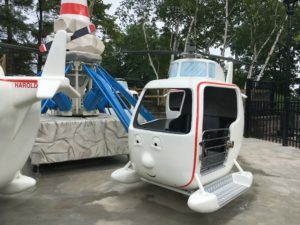 Harold’s Helicopter Tour – Helicopters that seat four, go up and down (kid-controlled) and around in a circle. Two seats in the front are for the kids, while the adults sit in the back. The helicopters were quite roomy, and had a wide door to get in and out. Children under 36″ must ride with a responsible person. Diesel Drivers – Climb aboard some diesel engines that go slowly around a track. Adults can sit beside the child, and it’s a very gentle ride for young children. Children under 36″ must ride with a responsible person. 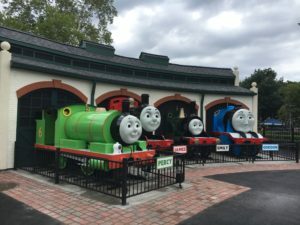 Journey with Thomas – A train ride with Thomas leaving from Kennywood Station. Ride the train through Kennywood and enjoy the view of the Monongahela River and the steel mill. Cranky’s Drop Tower – For a bit older Thomas fans, this drop down bounces up and down. Riders must be 42″ tall to ride. All the Thomas merchandise in one place to shop for the Thomas-lover in your life. Shirts, toys, hats, books, and stuffed trains line the shelves. One wall contains a cool pick-your-own section of mini trains. 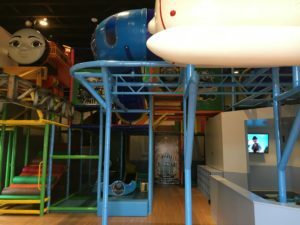 This area is attached to the store, and includes a multi-story soft play area with slide, a viewing area for Thomas videos, and a train table. Benches are available near the soft play areas, and a large family bathroom is inside the main door. 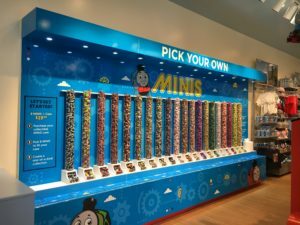 Thomas & Friends Big Adventure Play Zone is a great place to get out of the rain, or relax in the air conditioning, while your kids have fun in the soft play area or watch a video. There’s even a family restroom in the building for easy trips to the potty. There are live shows at the Tidmouth sheds where all the trains are parked. Check on the day you visit for show times to have even more fun with Thomas! Each ride is pretty easy for adults to enjoy as well. If your child is anxious about riding without you, this is a great place to ride with them! Looking for more information about Kennywood? Check out this post.